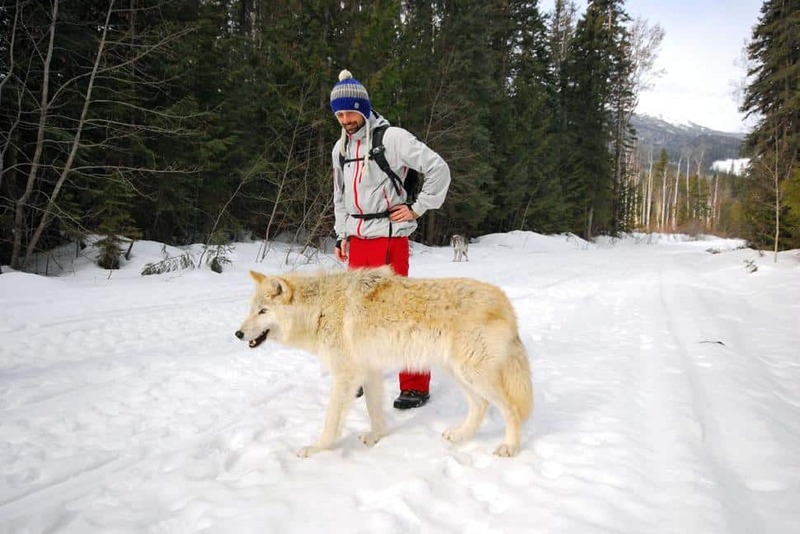 I am standing on a snow-laden forestry road near Golden, British Columbia, while a 30-kilogram grey wolf nuzzles between my legs. I should be terrified. But I’m simply in awe. 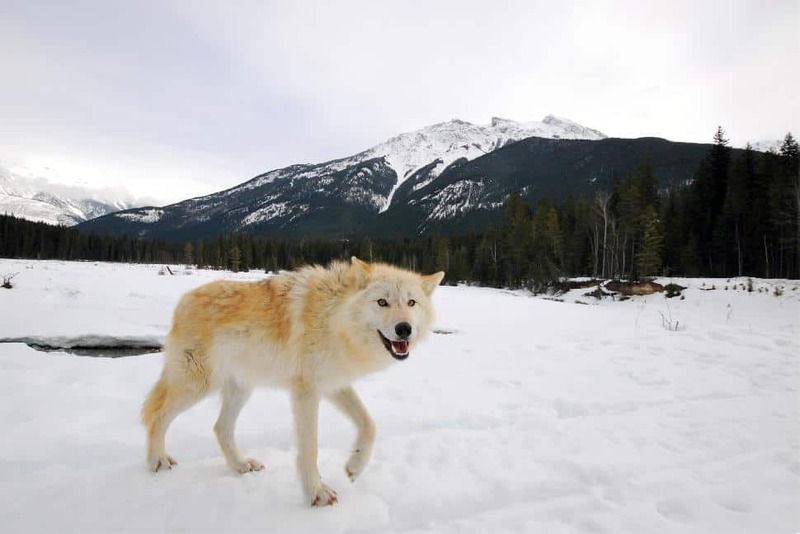 Today, we are Walking With Wolves — a unique, immersive wildlife experience in BC’s Kootenay-Rockies offered by the Northern Lights Wildlife Wolf Centre. 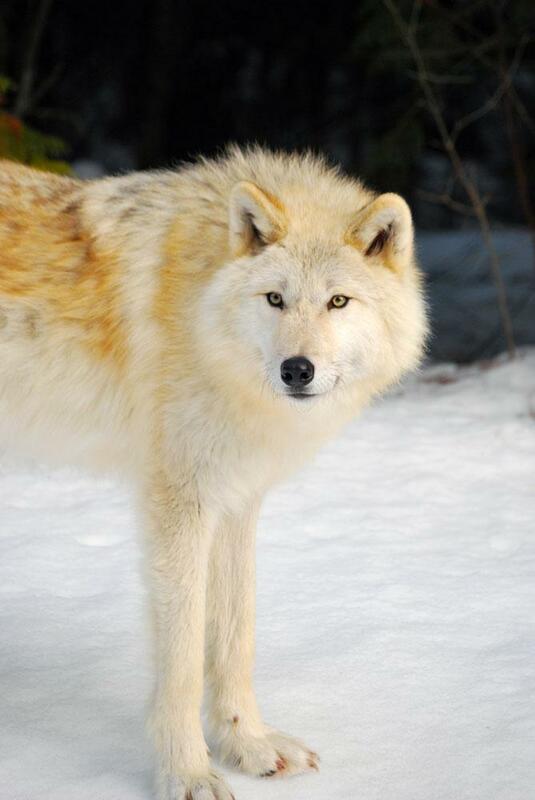 Located a short drive from downtown Golden, the NLWWC adopts and cares for wolves on-site — stewarding animals born in zoos, rescues and retirees from the film and TV industry. 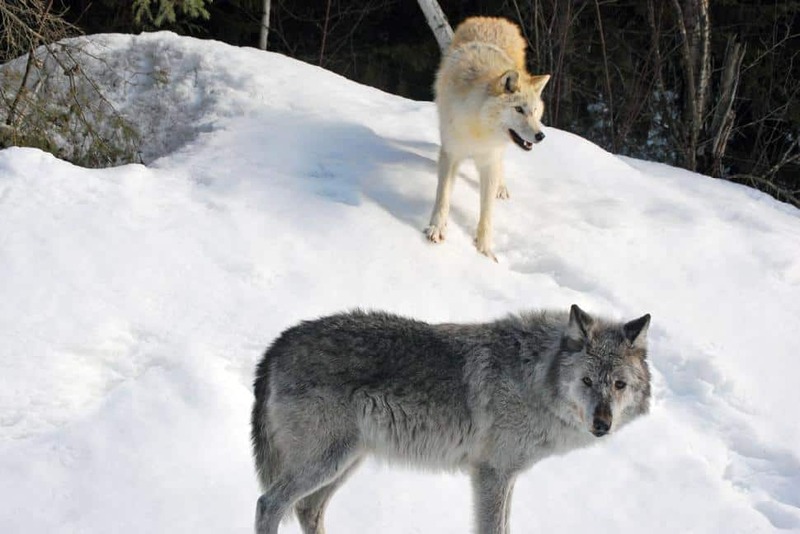 Along with guided tours of the facility, owners Casey and Shelley Black also run the Blackwolf Photography Tour, a two-hour educational experience that allows visitors to accompany a pair of wolves on an exercise run. 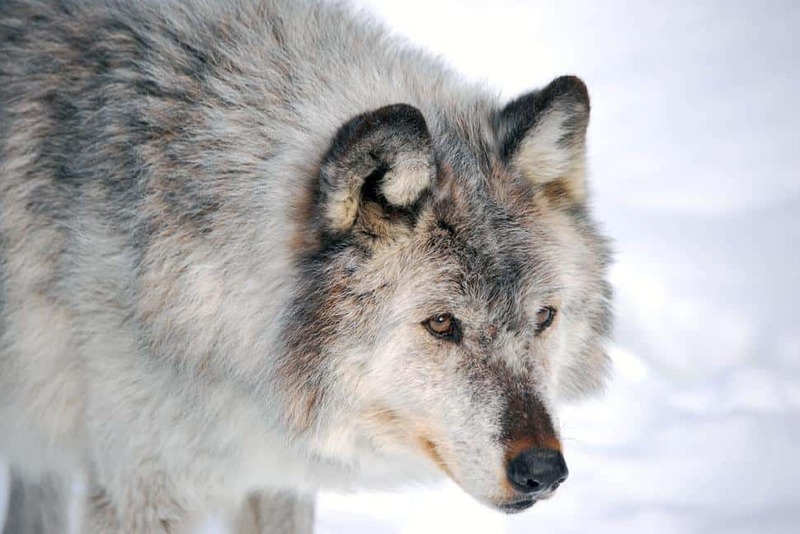 Tours run year-round, but winter is particularly popular as the wolves have thick coats and contrast nicely against the snow. Today, our group joins two local favourites — Scrappy Dave, a 30-kilogram, two-year-old reddish-beige male who lives up to his name; and Maya, a 20-kilogram, 14-year-old salt-and-pepper coated female who is more withdrawn and moves with an arthritic gait. 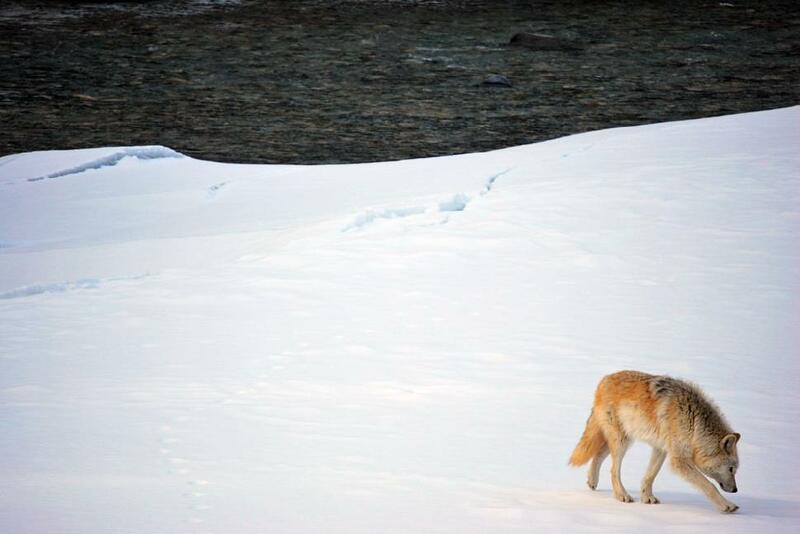 Back at home base, the largest animal in the pack weighs in at about 50 kilograms, “on an empty stomach,” adds Shelley. He is a little too bullish to walk with tourists, though. Initially, we’re all unsure of how to act around these off-leash wolves — but isn’t long until everybody in our group becomes at ease. 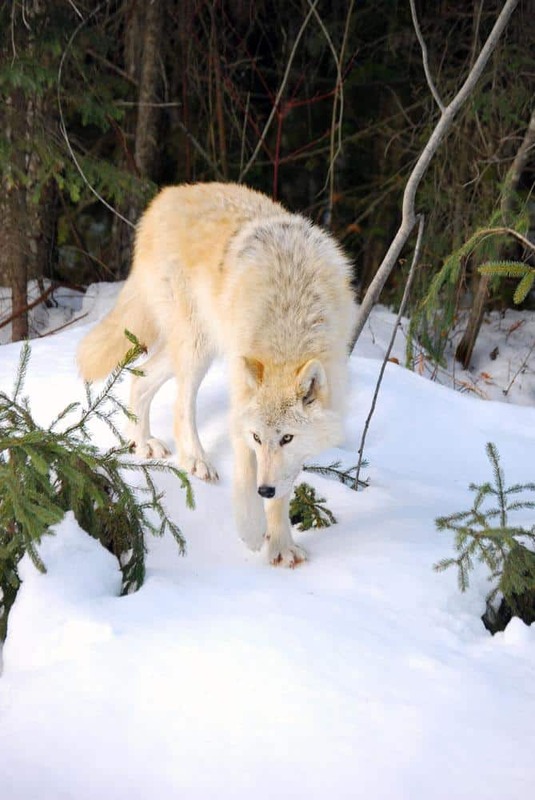 One of the main reasons the centre runs these tours is to break down some of the myths surrounding canis lupus — to show people these canines are actually timid-yet-social creatures, not the Big Bad Wolf of lore. 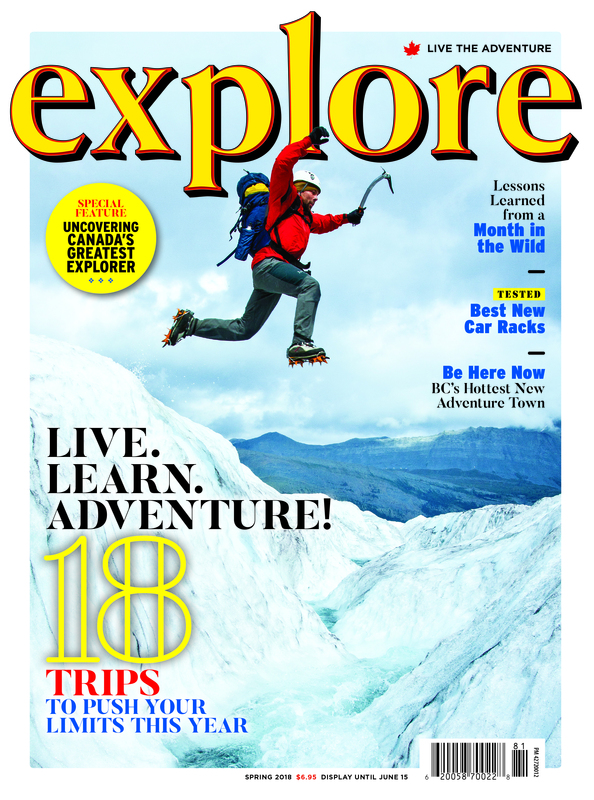 As we walk, Scrappy Dave wanders off to dig in the snow, biting off chunks of ice as he burrows — then he charges through our group, occasionally jumping up like the puppy he is. Maya stays back — she’ll come to you, when she decides it’s time and if she decides it’s time. “[Scrappy Dave] is a silly guy. He’s not afraid of people, but he’s afraid of everything else… he should have feathers. He’s a chicken,” says Shelley. Casey and Shelley are the Alpha Pair of their pack. Even rambunctious Scrappy Dave submits quickly to Casey. He may “playfully object,” as Casey says, but Dave knows who is in charge. In fact, we all do. The Blacks are Alphas in every way; unafraid to speak their minds about wildlife management (“Wildlife is treated like garbage in Canada,” mutters Shelley) or how wolves are portrayed in media (“We spend 10 years educating people about wolves then a movie like The Grey comes out and flushes it all down the toilet,” exclaims Casey). 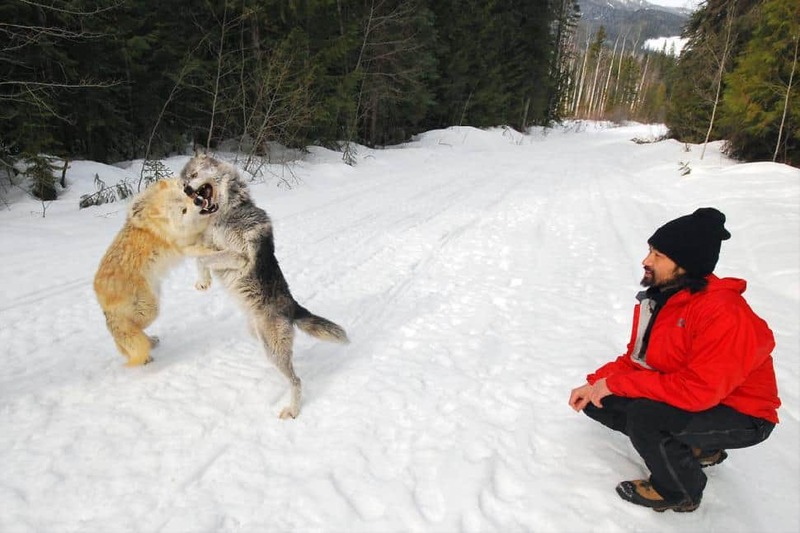 They are also very strict in how we must behave around the wolves. The photos I capture during the walk are gorgeous — I could spend a month in the woods and not get a wolf to pose like this. It is a little manufactured, sure, but the results are wall-hangers. Casey and Shelly are also happy to operate your camera for you, should Scrappy Dave or Maya take a shining to you. “We want everybody to leave with proof,” says Shelley. En route back to our vehicles, Casey enlightens me on wolf behaviour. I ask how, and if, he disciplines them. “You don’t. It would be like hitting a shy kid. He’d never get over it,” Casey says. “You hear biologists talk about how [wolves] are the ‘top predator,’ or ‘the perfect killing machine’… to me, they’re more of a scavenger,” he continues, explaining how wild wolves prefer to pick-off dead or dying animals, rather than actively challenge healthy ungulates. Shelley adds that many biologists feel wolves exhibit social behaviour more similar to humans than can be found in some primates. Wolves have long been feared in our culture. Shelley explains some of these phobias date to the time of the Black Plague, when wolves were seen scavenging on dead bodies at gravesites. Onlookers incorrectly assumed the animals were man-eating predators and not simply indifferent, hungry scavengers. Add in Fairy Tale villains (which were meant as metaphors) and wolves never stood a chance. The Blacks aim to change 800 years of bad reputation. And they may just do it, even if on a micro scale. In the brief time I spend with these animals, my opinion of wolves changes for the better — and I had a high opinion to start with. It is more “playtime” than a walk — we cover perhaps a kilometre or so in total — but I’ve already snapped a couple of hundred photos. A zoom lens helps, but most times they are close enough to use my 10mm. And by the time we return to our vehicles, I have learned more about wolves than I had in my previous 35 years combined. The Blacks hope that by observing and interacting with these wolves, visitors like us become advocates, promoting the cause of wolf conservation in any way we can. 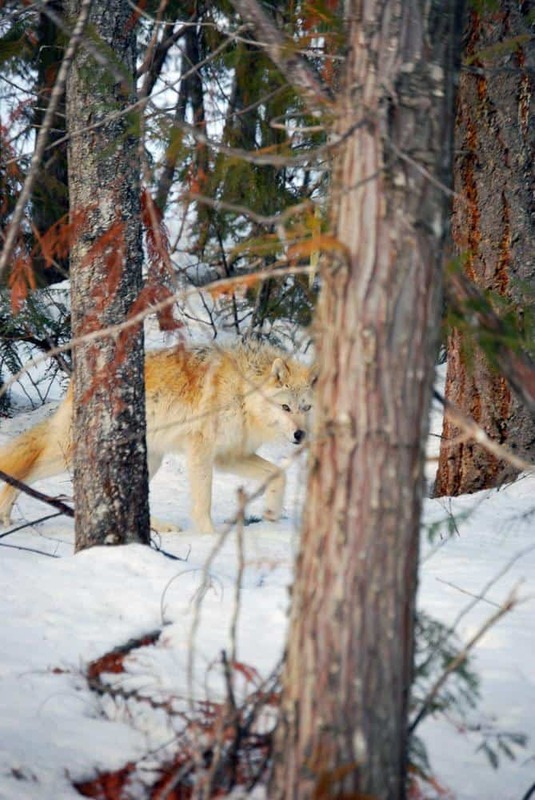 At minimum, the NLWWC seeks to alter public perception of these animals, one group at a time — showing us that wolves are not a predator to be feared or a pest to be exterminated, but a vital part of our ecosystem that helps keep nature in balance and deserves as much protection as any other keystone species. So who’s afraid of the Big Bad Wolf? Not me. Not anymore.